Solving the puzzles and brain teasers is lot of fun. Solving brain teasers increases our logical thinking ability. Here are some brain teasers questions and answers to make you think. These brain teasers are for all age groups from kids to teens and adults can enjoy solving these brain teasers. Answer to these Brain teasers is given at the end. These brain teasers are part of Fun Brain Teasers and Riddles. 1. A Sweet girl purchased a book from a bookkeeper and give him ₹1000. The cost of book is ₹200 but the bookkeeper had got no change, so he get the change from next shop and return the girl her 800 Rupees. After some time the next shopkeeper comes with the ₹1000 note and told the bookkeeper that the note is fraud, so he takes money back. How much loss did the bookkeeper face ? 2. Can you find the odd number in the following? 3. Suppose you are trapped in a room. The room has only two possible exits by two doors. By passing through the first door there is a room constructed from magnifying glass. The blazing hot sun instantly fries anything or anyone that enters. Through the second door there is a fire-breathing dragon. How will you escape? 4. Outside a room there are three light bulb switches. One of switch is connected to a light bulb inside the room. Each of the three switches can be either "OFF" or 'ON'. You are allowed to set each switch the way you want it and then enter the room. Please do note that you can enter the room only once. Your task is to then determine which switch controls the bulb ?? 1. Tough Interview Logical Questions With Answers : This contains some of the tough Logical Question which are often asked during the interviews of big companies like Faceback, Microsoft or Google. Try to see if you can clear interview of such companies. 2. 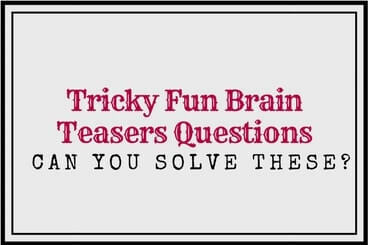 Out of Box Thinking Fun Brain Teasers with answers to Challenge your Mind : These are very interesting Fun Brain Teasers which will make you think out of Box. 3. 5 Challenging Brain Teasers For Adults With answers and Explanation :These are interesting Mathematical puzzles in which you have to deduct the pattern and then solve for the missing number. 4. What Comes Next In The Sequence Puzzles With Answers: These are very cool Sequence Puzzles in which one has to find which number will come next in the series. Answer to these brain teasers is given as below. To avoid any spoiler, I have hidden the answers to these brain teasers. Do select the area between the numbers to watch out the corresponding answer of a brain teaser. 1. It is ₹1000 which bookkeeper lost and it is ₹1000 which girl gained. Lets understand it with net loss gain equation. The next door shopkeeper does not lost/gained anything. He gave ₹1000 initially and later got it back same amount. Now how much worth girl gained. Girl took away book worth ₹200 and got change of ₹800. So in total she gained ₹ 1000. Now whatever girl gained is lost by shopkeeper i.e. ₹1000. Book worth ₹200 and ₹800. 2. 3642 is odd one out. All others numbers' digits adds to a prime number. 3. This is an easy one. You can escape through the room having Magnifying glass during night. There will be one off bulb but will be hot, it corresponds to Switch A. There will be one on bulb which corresponds to Switch B. Remaining off and normal temperature bulb corresponds to Switch C.
Here is answer to 13th Brain Teaser Question of post titled "Out of Box Thinking Fun Brain Teasers with answers to Challenge your Mind ". I have hidden this answer to avoid any spoiler. Do select the text below to read the answer.